The Sachse Police Department is pleased to announce the creation of a new Community Chat program. The police department continues to look for new ways to build on the relationship we have with our community. By creating an informal setting for which you can get to know your police officers, we can continue to develop community relationships. At Community Chat, we want you to ask any questions you may have, inform us of anything going on in your neighborhood, and tell us about any concerns. 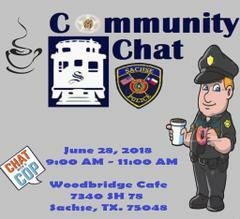 The first Community Chat event will be held at Woodbridge Cafe on June 28, 2018 from 9:00 AM until 11:00 AM.